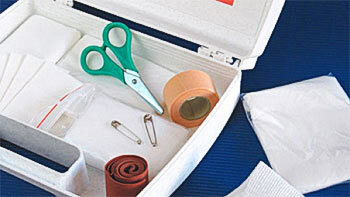 If your company employs five or more employees, it must meet the minimum First Aid requirements. First Aid is crucial. It can mean the difference between a minor injury and a costly disabling injury or even death. You must take all reasonable steps to ensure employees receive prompt First Aid. To do this, you need to ensure you have employees properly trained in First Aid on your premises. Only use a certified company to train your First Aiders. This company must be accredited by the Department of Labour. Verify this by finding the training company’s Chief Inspector (CI) number on its certificate. 3. Any other company accredited by the Department of Labour. What should you do if someone has a heart attack? If someone has a cardiac arrest or heart attack, there may be only a few minutes to act before it is too late. It is vital to know what to do beforehand. To perform CPR (cardiopulmonary resuscitation) and artificial respiration (mouth-to-mouth resuscitation) effectively, training and frequent practice on resuscitation dummies are essential. How can you tell if someone is having a heart attack? • Look at the patient's chest to see if it is rising and falling. If they are breathing, place them in the recovery position, and then call for help from the emergency services. • If they're not breathing, they are in respiratory arrest and the current advice states that in this situation, they are also likely to be in cardiac arrest (cardiac arrest is a condition where the heart has stopped beating effectively). • It's best to treat them as if they are in cardiac arrest, rather than waste valuable time looking for a pulse. The latest guidelines suggest that lay persons should not try to find a pulse. Instead, CPR should begin immediately on anyone who is unresponsive and not breathing normally since even a delay of just a minute or two spend looking for a pulse can have a very substantial detrimental effect on the outcome. • If the patient is not breathing, call for help immediately, stating that the casualty is not breathing. You should also provide resuscitation (see below) until the patient begins to breathe or the paramedics arrive. If there is no breathing, the patient is in cardiac arrest. • Immediately place the palm of your hand flat on the patient's chest just over the lower part of the sternum (breast bone) and press your hand in a pumping motion once or twice by using the other hand. This may make the heart beat again. • provide immediate cardiac massage (‘pumping the chest’, see below), and then artificial respiration. How do I perform CPR (cardiopulmonary resuscitation)? The aims of cardiopulmonary resuscitation are twofold. And secondly, to artificially blow oxygen into the lungs – this is done by artificial respiration. CPR is the combination of both chest compressions, to support the heart, and artificial respiration, to support the lungs. The recommended guidelines are that CPR should begin with 30 compressions and then two rescue breaths and then continued at 30 compressions to two breaths. How do I perform chest compressions? • press down firmly and quickly to achieve a downwards movement of 4 to 5cm, then relax and repeat the compression. After each compression, release all the pressure on the chest without losing contact between the hands and the sternum. • do this 30 times, then give artificial respiration twice, and continue this 30:2 procedure until help arrives. • Tilt the head back and lift up the chin. • Pinch the nostrils shut with two fingers to prevent leakage of air. • Take a deep breath and seal your own mouth over the person's mouth. • Breathe slowly into the person's mouth – it should take about two seconds to adequately inflate the chest. • Check to see if the chest rises as you breathe into the patient. • If it does, enough air is being blown in. • If there is resistance, try to hold the head back further and lift the chin again. • Repeat this procedure until help arrives or the person starts breathing again. • The ratio of chest compressions to breaths is 30:2 for both one-person and two-person CPR. • Continue until the ambulance arrives or the patient gets a pulse and starts to breathe again. • If the pulse returns and breathing begins but the person remains unconscious, roll them gently onto their side into the recovery position. This way mucus or vomit can get out of the mouth and will not obstruct the patient's breathing. It also prevents the tongue from falling back and blocking the air passage.